This fun slouch hat is made from a kit that has 24 different yarns, no repeats. 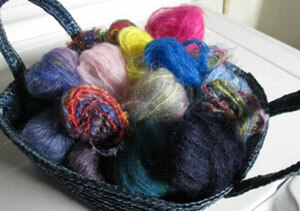 Most are brushed mohair or mohair boucle, some are Fleece Artist hand dyed yarns. Two of the yarns are eyelash yarn for an extra bit of texture. 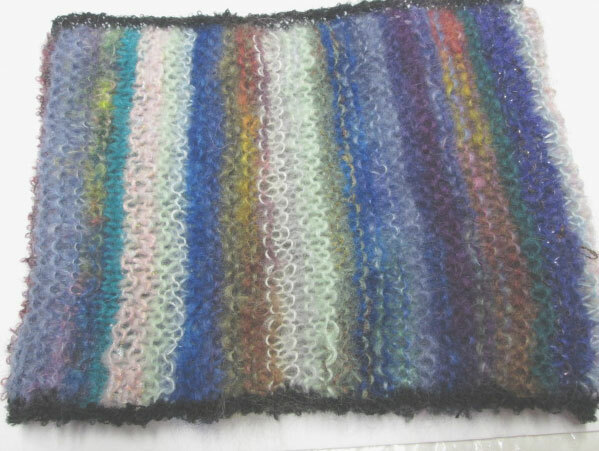 It is very easy to knit and would probably be made in an evening or two. It is knit with 6mm needles so it knits up quickly. 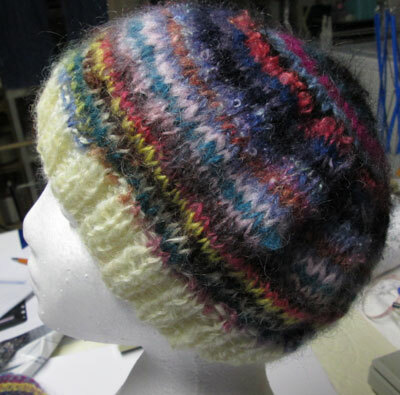 To get the swirl effect you are knitting each colour and moving on to the next colour around the hat, sewing up the seam and then picking up the stitches around the bottom to knit the bands. Sounds a bit complicated but is really easy. Each kit is slightly different then all the others as the colours vary a bit. You can make it with or without the crazy top knot . Great idea for gifts for the winter season for the young and young at heart. 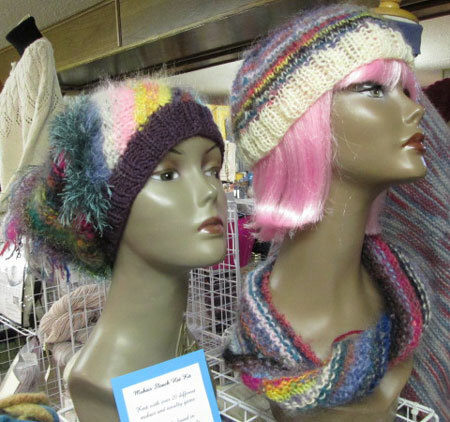 This fun hat and cowl are made from a kit that has 24 different yarns, no repeats. 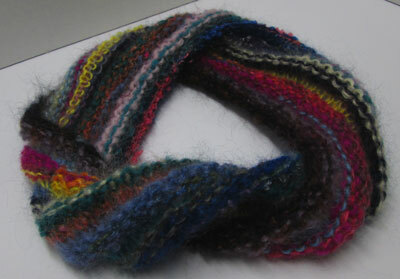 Most are brushed mohair or mohair boucle, some are Fleece Artist hand dyed yarns. It is very easy to knit and would probably be made in an evening or two. 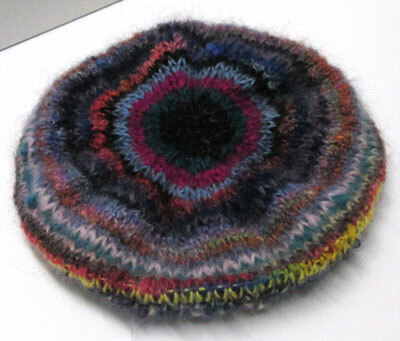 The hat is knit with 5 mm dpn in the round. Each kit is slightly different then all the others as the colours vary a bit. 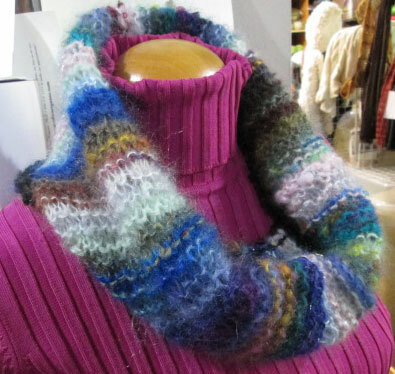 This fun wide cowl is made from a kit that has 24 different yarns, no repeats. 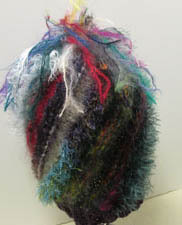 Most are brushed mohair or mohair boucle, some are Fleece Artist hand dyed yarns. It is very easy to knit and would probably be made in an evening or two. It is knit with 8mm needles so it knits up quickly.